Spring is the season of masonry repairs in Toronto! Winter has come and gone, and the weather is finally starting to warm up again, creating more ideal conditions for masonry repairs. While winter is the leading season for masonry damage, it’s the worst time to of year conduct most masonry repairs. In order to prevent masonry issues from increasing in severity, it’s best to take care of repairs as soon as possible–aka in the spring. Mortar will cure at temperatures below 50 degrees F, but it will not cure in below freezing temperatures. Without proper climate for curing, it’s very easy for mortar to not properly set and as a result lack strength and longevity. That’s why a lot of masonry repairs are postponed until spring. There are measures that can be used to apply masonry repairs in winter, such as installing heaters, covering the area with a tarp or building a temporary structure. But it is recommended to wait until spring if possible. After a long cold winter with plenty of time spent in front of the fireplace, your chimney might not be in top-notch working order. Many people have their chimney inspected and repaired in spring. Albeit, the best time to conduct chimney repairs is often in the fall, just before winter when chimney usage goes through the roof–literally. Common chimney repairs include replacing the chimney crown or chimney cap, having the chimney swept clean or removing and replacing damaged bricks and mortar on the structure of the chimney (tuckpointing). Larger chimney repairs include rebuilding the fireplace or installing a new chimney flue. Spalling bricks are commonly seen in the spring after a winter filled with freeze and thaw cycles. As moisture trapped in masonry structures freezes and thaws with the temperatures, it creates pressure that eventually results in entire bricks breaking off and falling from the structure. There are many potential causes to spalling bricks and before you can fix the bricks you must address and resolve the underlying problem. Is a leak allowing water inside? Is standing groundwater frequently soaking brick? Do you need a new drainage system to move water away from your home? Did you ever apply a non-breathable sealant to bricks? Once the problem is identified and addressed, the spalling bricks are repaired in a process known as tuckpointing. The damaged areas are cleaned out and prepped, and a close match of the original mortar is put together. This may include conducting tests on mortar to determine its makeup and best match. If you use the wrong type of mortar for repairs it can cause more problems instead of helping. The new mortar and bricks are then applied in place. In some cases you can reuse old bricks by turning them to face the other way in the wall. This can help save money on materials and is the preferred method for historic buildings. Historical buildings often undergo masonry repairs in the spring because it’s too risky to conduct repairs in the winter. Historical properties are very sensitive to the elements, and they are just as sensitive to repairs. Improper practices can harm the value of a property and cause materials to degrade at a faster pace, for instance if the wrong type of mortar is used. Turnbull Masonry specializes in historical masonry repairs with a focus on proper practices that elongate a building’s lifeline and preserve historical value. After a long winter filled with rain it’s tempting to jump the gun and add sealant to your masonry structure. Masonry sealants are a highly debated topic, but they are commonly applied in the spring. Some sealants offer benefits but non-breathable sealants can cause more damage than good. 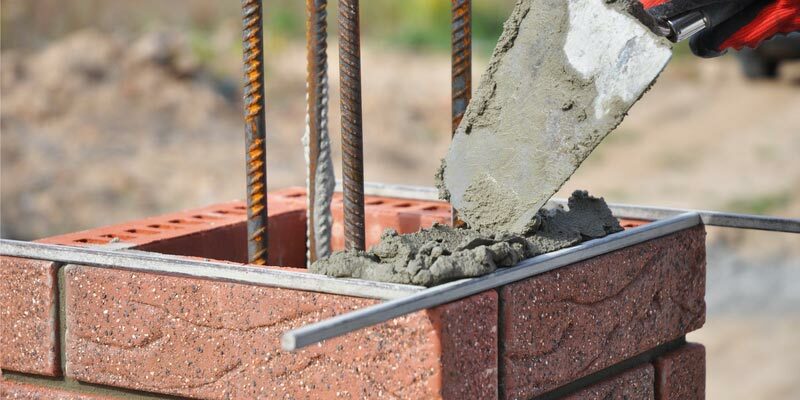 Here’s why: Bricks and other types of porous masonry naturally take moisture in and out, moisture only causes damage when it becomes trapped within mortar or brick. This can occur as a result of too much water getting inside, say for instance if you have a leak, recurring floods or poor drainage systems. Moisture will also get trapped inside if you apply a non-breathable sealant to mortar. Non-breathable sealants don’t prevent all moisture from getting in, but they do lock moisture from getting out. That includes any moisture inside of the wall at the time the sealant is applied. Efflorescence increases after a period of wet and cold weather, hence why homeowners commonly notice Efflorescence in the spring. Efflorescence is caused when water evaporates through the surface, at which time the salts and minerals in the water are left behind because they do not evaporate. These left behind minerals produce the white, yellow or brown deposits associated with efflorescence. Virtually the same exact process causes those annoying white stains on hats, t-shirts and other clothing that soak up your sweat. Efflorescence varies in severity and is often completely harmless and nothing more than an eyesore. Masonry professionals can determine the best course of action to remove efflorescence, although in many cases there is no fix-all solution and it will return. The presence of efflorescence can increase based upon construction of masonry. Long before bricks start to give out, the mortar breaks down. If repairs are not made in a timely fashion, bricks, stone or whatever the mortar holds up, will begin showing signs of damage. Mortar is cheaper and easier to fix than bricks. It is actually supposed to break down over time as it is engineered to take on the majority of wear and tear, as a result preserving more costly materials like brick and stone. A long winter can start to wear on mortar joints. If mortar feels crumbly to the touch, is discolored and/or coming loose, it needs to be repaired before the rest of the structure shows damage. Mortar must be properly matched, the old mortar removed and the new mortar applied and cured. From repairs to rebuilds, Turnbull Masonry takes care of all of Toronto’s masonry needs!